Chancery, and adjoining outbuildings, now a house. C13, C14, late C15, C16, late C17. Altered early C18 and late C19. Rear range has substantial remains of buildings erected in the time of Chancellor Antony Bek, 1321-1329. 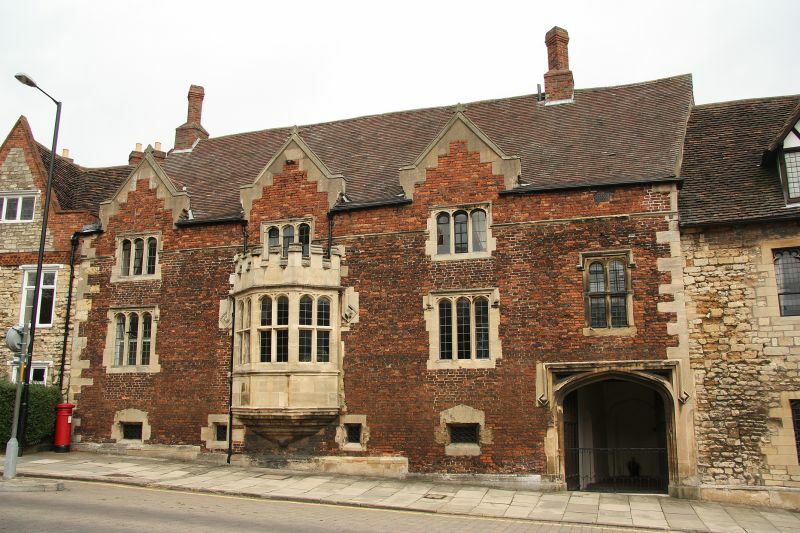 Street range and parlour wing probably built by Chancellor Geoffrey Simeon, 1485-1506, incorporating the arms of Bishop John Russell, 1480-94. Dressed stone and coursed rubble with brick front and rear additions, timber framed parlour wing with close studding and rendered nogging. Plain tile and slate roofs with various brick stacks. EXTERIOR: 2 and 3 storeys plus basements and attics, L-plan. Front range, 4 bays, has plinth, quoins, string course, and single ridge and gable stacks. Symmetrical section, to left, 3 bays, has central canted stone oriel window with 3 cross casements and crenellated parapet. On either side, a renewed 3-light window with stone mullions and hoodmould. Above, 3 smaller similar windows under C19 through-eaves dormers with coped gables. Basement has 4 openings with stone surrounds the outer pair larger. Entrance bay to the right, has 4-centred arched doorway with hoodmould and studded panelled double doors, c1500. Above, a stone mullioned cross casement with hoodmould. At the rear, in the return angle, parlour wing, 2 storeys plus attics, single bay, jettied on 3 sides. Restored early C20. To its right, medieval solar with early C19 brick front, 3 storeys. Beyond, under 3-bay loggia, 1955, 3 chamfered pointed arched doorways, early C14, the central one restored 1873, formerly the entrances to service rooms and staircase off the medieval hall. Beyond again, former kitchen, 2 storeys, 2 bays, and former outbuildings, now house. INTERIOR: first floor Great Chamber in front range has moulded cross beam ceiling and bosses, c1500, and early C18 moulded panelling, doorcases and fireplace with broken pediment. Enclosure in South-East corner conceals a stone winder stair, c1500, with traceried 3-panel door into entrance passage. Adjoining room to North has early C18 wainscot and bolection moulded fireplace. Front range has a largely intact principal rafter roof, c1500, 4 bays, with double purlins. At the rear of the great chamber, a landing with panelled doors in simply moulded surrounds, and a short staircase with heavy turned balusters and squared newels, all early C18. Parlour wing has a first floor room with a stone panelled fireplace lintel, c1500, and an early C18 cornice and ceiling, covering moulded joists. Ground floor has similar moulded joists and dragon beam. North range has ground floor dining room c1500, with C18 panelling and resited mid C18 Classical fireplace. To East , first floor chapel, C14, altered c1500 and restored C19, with moulded joists, spine beam and boss and close studded West wall incorporating a screen with traceried unglazed lights and door. To South East, an ogee headed piscina and bracket. This building is important as a surviving example of early C14 and late C15 domestic building, and because of its early use of a brick front. In addition to being the official residence of high ranking clergy, it was leased c1381-1397 by Katharine Swinford.